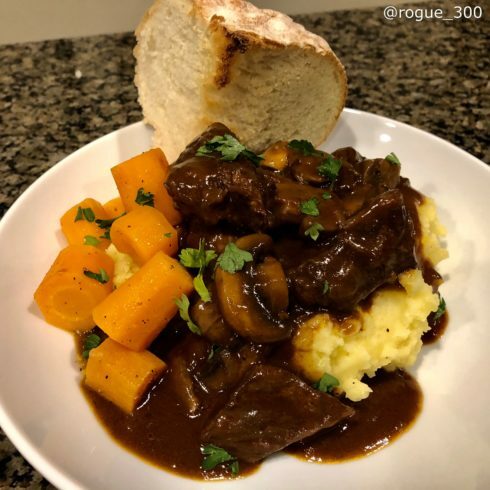 Beef burgundy – this classic French peasant dish is as easy as can be, and will fill your kitchen with such a comforting aroma, so break out that French or Dutch oven, and let’s get to it! Note: This makes enough for 4 or 5 good size dinners and reheats very well. Preheat oven to 325 degrees. In a medium bowl, whisk together the beef broth, flour, and tomato paste. Set aside. Make an herb bouquet with parsley, rosemary, thyme, and bay leaves by placing it in a large square of cheesecloth and tying it with kitchen twine, or by simply tying the herbs together – cheesecloth will prevent any pieces from coming off into the sauce, but it’s not completely necessary if you don’t have it. In a large, heavy French or Dutch oven with a snug fitting lid, heat bacon drippings over medium heat. Season beef with salt & pepper. Add half of the beef to the pot and brown on all sides, remove to a clean bowl, and repeat with the remaining beef, removing it the same bowl when browned. Add the sherry wine followed by the onions and cook for 5 minutes, stirring occasionally. Give the beef broth mixture a good whisk or two, and pour into the pot. Increase heat to medium-high and bring to a rapid boil. Stir in the red wine. Return the beef to the pot, and nestle the herb bouquet in the center.Cover and braise in the preheated oven for 2.5 hours. Melt the butter in a large skillet and saute the mushrooms. Remove the herb bouquet from the pot and discard. Stir the mushrooms into the sauce and serve over mashed potatoes with a sprinkle of parsley for garnish and side of bread.